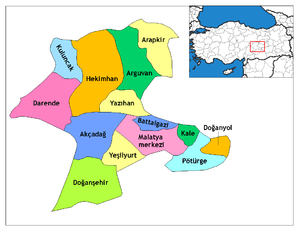 Arapgir (Armenian: Արաբկիր) is a town and district of Malatya Province, Turkey. As of 2000 it had a population of 17,070 people. It is situated at the confluence of the eastern and western Euphrates river, but some miles from the right bank of the combined streams. Arapgir is connected with Sivas by a chaussée, prolonged to the Euphrates river. The present town was built in the mid-19th century, but about 2 miles north-east is the old town, now called Eskişehir ("old city" in Turkish). Its current mayor is Haluk Cömertoğlu (AKP). The old town of Arapgir was founded by the Armenian King Senek'erim-Hovhannes in 1021, who had exchanged his kingdom for estates in the central lands of the Byzantine Empire. It remained under Byzantine Empire's control until 1071, when the Seljuk dynasty conquered the city. In the fourteenth century the Ottoman Empire gained the city from the Seljuks. Under Ottoman rule, Arapgir was part of Mamuret-el-Aziz Province. The town was famous for the grapes and mulberries that grew in the area. The city was known as Arabraces during Byzantine rule (Αραβράκης in Byzantine Greek). Arapgir was the site of a fascinating story of rising textile imports and industrial growth as of the 1830s. In 1836, some 1,000 looms in Arapgir were weaving cotton goods from British yarn and by 1907, some 1,200. Durability and color fastness of locally made manusa textile also retained its competitive position. The city grew larger than the province (vilayet) center of Harput and a municipal administration was established in 1883. According to Donald Quataert, Arapgir in the 1880s was made up of 4,802 Muslim and 1,200 Armenian households, with a total population of about 29,000 persons. According to a METU study citing Nejat Göyünç, the city population was about 20,000 in 1911, of which more than half of the population was Armenian Christians and the rest were Muslim. Differing sources present differing pictures for the respective shares of ethnicities within the weavers' community. The Armenian population is reported to have suffered severely during the Hamidian massacres of 1895, although, in this regard, Donald Quataert notes, with textile exports back to normal levels a year after the turmoil, in 1896, either all weavers were Muslims after all, or few Armenian weavers were killed, displaced or disrupted during the troubles. On the eve of World War I, there were about 9,523 Armenians (1,300 houses) and 6,774 Turks living in Arapgir. After the 1915 Armenian Genocide, most of the Armenian population of Arapgir was killed or deported. In 1922 the remaining 800 Armenians of Arapgir found refuge in Soviet Armenia. Those who settled in Yerevan lived in a quarter that is now called Arabkir District. Before the Armenian Genocide Arapgir had seven Armenian Apostolic churches: Surp Astvadzadzin (Holy Mother of God) Church, not to be confused with the cathedral, Grigor Lusavorich (Gregory the Illuminator) Church, Surp Kevork Church, Surp Hagob Church, Surp Nshan Church, Surp Pilibos Arakel (St. Philip the Apostle) Church, Surp Sarkis Church, There were, also, one Catholic Surp Prgich (Holy Saviors) Church and one Protestant Cuğran Church. There were also more than 10 schools in the town. Little is left of pre-war Arapgir, but there are still some old houses that have survived, which are Armenian origin. The town also contains the ruins of a castle, several Seljuk mosques, old cemetery and silver mines. Zehra Bilir (1913-2007), famous singer of Turkish folk songs known as "Turku Ana" (Mother of Folk Songs). After her death it was revealed she was born Armenian by the name of Eliz Surhantakyan. ↑ Kévorkian, Raymond H. and Paul B. Paboudjian, Les Arméniens dans l’Empire Ottoman à la veille du génocide. Paris: Editions d’art et d’histoire, 1992, p. 375. ↑ limited preview Donald Quataert; et al. (1993). Ottoman Manufacturing in the Age of the Industrial Revolution. Cambridge University. pp. 86–99. ↑ Nejat Göyünç (1983). Osmanlı idaresinde Ermeniler [Armenians in the Ottoman Administration] (in Turkish). Gültepe Yayn. Ankara. ↑ "...in the Center of Arapgir, the Armenians formed 53% of the total population while they formed only 18% of the population in the periphery areas of Arapgir." Pınar Kundil. (Masters Thesis full text) "The Armenian question according to Takvim-i Vekayi" Check |url= value (help) (PDF). Middle East Technical University, Ankara. Retrieved 2007-05-05. ↑ Hewsen, Robert H., "Golden Plain: The Historical Geography of Tsopk/Kharpert," in Armenian Tsopk/Kharpert, ed. Richard G. Hovannisian. Costa Mesa, CA: Mazda Publishers, 2002, p. 49. ↑ Kévorkian and Paboudjian, Les Arméniens dans l’Empire Ottoman, pp. 375-76. ↑ Kévorkian and Paboudjian, Les Arméniens dans l’Empire Ottoman, p. 376. This article incorporates text from a publication now in the public domain: Chisholm, Hugh, ed. (1911). "Arabgir". Encyclopædia Britannica (11th ed.). Cambridge University Press.